When you watch movies as a hobby, there are always thoughts in your head that maybe you've seen it all. But then again, stuff comes up and you feel like surprised again. That can be great fun, if its handled correctly. In 2014, I reviewed a film called "Locke" which took place entirely in a car, about a guy calling people from the blue-tooth in his car. That was the storytelling device, and there was a compelling story that was born out of that device. You can pretty much make a movie out of anything, and it has the potential to be good. I firmly believe that there is no bad idea. It all boils down to execution. 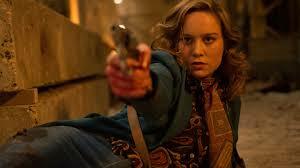 "Free Fire" is literally an hour-and-a-half shootout. Set in the 1970's, it is a movie about a gun deal gone bad. A group of gun sellers; Vernon (Sharlto Copley), Martin (Babou Ceesay), and Harry (Jack Reynor) meet with IRA buyers Chris (Cillian Murphy) and Frank (Micheal Smiley) and their associates. They are brought together by middle man Ord (Armie Hammer) and are accompanied by intermediary Justine (Brie Larson). Harry knows one of the IRA associates, and he beat him up the night before. There is an argument, a brief scuffle, but nothing serious. Both parities want to defuse the problem quickly, so the sale can move forward and everybody gets what they want. Sadly, that doesn't happen, Harry pulls a gun. He starts shooting. The IRA draw their guns and start shooting, and soon a line is drawn and people pick sides. What ensues is a gun fight, with style and laughs, but nothing even resembling character development. Every character in this show is a stock character from another gangster movie. Tough guys, who shout profanity, can't shoot straight, and just want the other side to die. There is nothing to them, and because the movie is all about the bullets, there is no time to get to know any of these guys. Yes, gangsters should be charismatic, yes they should be tough, but if we never get to know them, why would we care who ends up leaving this site alive? What's even worse is that there are some twists and turns introduced in the movie, but with no development, they fall with a loud thud. Never adding anything engaging to the movie. "Free Fire" is at least watchable due to its cast. Yes, you read all of that right. This movie features Brie Larson, Armie Hammer, Sharlto Copley, Cillian Murphy and even Noah Taylor. These are great actors, and they do great work here. I am not sure you can cast people like that and not get a product that is, at the very least, well acted. These actors land the punchlines, make the movie funny, make it interesting, at least they keep your eyes open. Sadly, the way the script lays out, its not enough in the end. Is it worth a look? Depends on the film fan. If you don't like shoot 'em ups in search of an actual movie, you may not like it. If you like seeing actors having some fun, you may like it. If you can't stand non-character development, you'll hate this.